A New Foreign Policy explores both the danger of the "America first" mindset and the possibilities for a new way forward, proposing timely and achievable plans to foster global economic growth, reconfigure the United Nations for the twenty-first century, and build a multipolar world that is prosperous, peaceful, fair, and resilient. The American Century began in 1941 and ended on January 20, 2017. While the United States remains a military giant and is still an economic powerhouse, it no longer dominates the world economy or geopolitics as it once did. The current turn toward nationalism and "America first" unilateralism in foreign policy will not make America great. Instead, it represents the abdication of our responsibilities in the face of severe environmental threats, political upheaval, mass migration, and other global challenges. 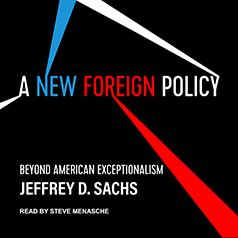 In this incisive and forceful book, Jeffrey D. Sachs provides the blueprint for a new foreign policy that embraces global cooperation, international law, and aspirations for worldwide prosperity—not nationalism and gauzy dreams of past glory. He argues that America's approach to the world must shift from military might and wars of choice to a commitment to shared objectives of sustainable development. A New Foreign Policy explores both the danger of the "America first" mindset and the possibilities for a new way forward, proposing timely and achievable plans to foster global economic growth, reconfigure the United Nations for the twenty-first century, and build a multipolar world that is prosperous, peaceful, fair, and resilient.